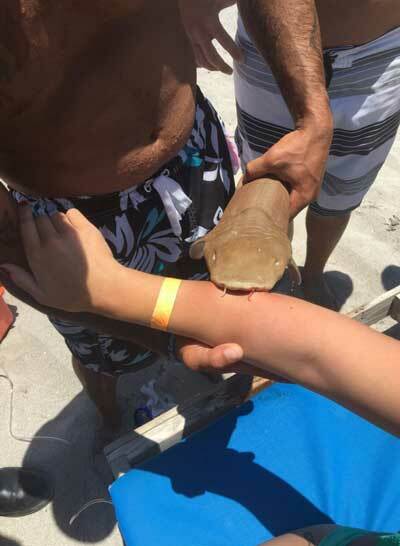 A 23-year-old woman was bitten on the arm by a small nurse shark on Sunday afternoon on a beach in Florida, according to Boca Raton Fire Rescue. The incident happened at around 1:20pm at a Boca Raton beach. Crews arrived at the scene and found the 2-foot shark attached to the woman's right forearm. Officials say the shark had been killed prior to the fire department's arrival. The patient was transported to Boca Regional Hospital with the shark still attached. She is listed in stable condition. Lifeguard Mike Glusac was first on scene. It is unclear why the shark latched on. "Might have just been startled. She might have brushed it with her arm." Shark expert and conservationist Jim Abernethy says nurse shark bites happen several times a year. He says most of the time they are provoked. "I would say close to 100 percent of the so-called attacks are actually the case where someone is messing with the shark because it's so docile," says Abernethy. He says nurse sharks are common in South Florida and can sometimes be 14 feet in length. News reports of this incident mention that the woman was harassing the shark by repeatedly pulling its tail. Finally it got ticked enough to whip around and bite her. As usual, the result of human ignorance is the shark dies, while the woman gets undeserved sympathy. She deserves to be charged with abuse.